In Series 1 of "the Router Workshop" Bob and Rick used a 3/8" spacer fence with a 1/2" dovetail bit to and cut dovetails on a square block. 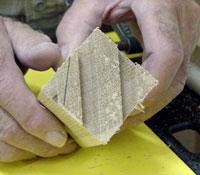 This unique joint was used to construct the mug tree featured on this series! 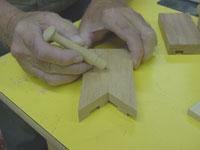 This technique has also been used to join multiple blocks of different wood types together and then turned into a cane. 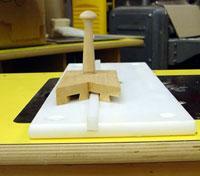 Check out this quick tip on how to make the holding jig for this joint! 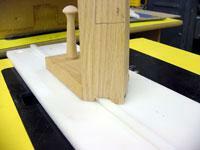 In order to get an accurate angle for the holding jig cut a stick in half on a 45 degree angle and glue the two pieces together. 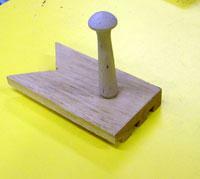 Drill a hole part way through and mount a shaker peg. 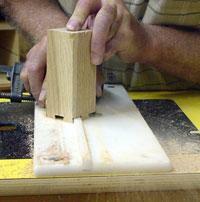 Use a 3/8" spacer fence with 1/2" dovetail bit to make the cuts on the bottom of the holding jig. The first cut is tight against the fence, then step over and make the next cut. Be sure to go right out the end of the jig. 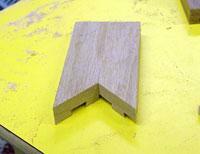 This will allow you to hold a 2" square block while cutting angle dovetails with a 3/8" spacer fence.